Books can become a lifeline for incarcerated folks but they generally have little access to reading material and incarcerated LGBTQ+ people can have a particularly hard time finding books that meet their needs of identity representation. Donating queer books to our local prisons’ libraries will show the LGBTQ+ population behind bars that there is a supportive community on the outside that cares about their wellbeing and the reaffirmation of their identities. 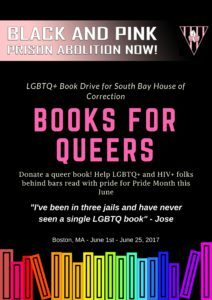 We will be collecting books (preferably books within the queer YA genre at an intermediate reading level) for Pride Month (throughout June) for their donation to the South Bay House of Correction in Boston. Our goal is to collect at least 200 books, and if we surpass that number we will be donating the rest of the books to other local jails and to LGBT Books for Prisoners. The reason we chose South Bay Jail as the primary beneficiary of this book drive is because one of our formerly incarcerated members, Lexi, who was imprisoned there, mentioned to us how sad and frustrated she was when she visited the library and couldn’t find any LGBT books. It is our job as “free world” allies to make these resources more available to our LGBTQ family in prison to let them know their identities are valid and valued. Bonus: If you use Amazon Smile Program, when you purchase a book through our gift registry, Amazon will donate 0.5% of the price of your Amazon purchase to Black and Pink. In order to have Amazon make a donation, you must visit Amazon Smile first and designate Black and Pink as your charitable organization for the donation. After you pick, you can visit our registry on Amazon Smile and once you purchase, Amazon will make a donation! 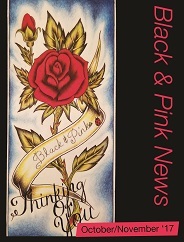 Drop off your books at the Black and Pink booth at Pride Festival on June 10! If you donate 3 books or more through any of our donation methods, you get a free Black and Pink mug! Also, the three people who donate the largest number of books will be mentioned in recognition for their generous donation in the monthly B&P Newsletter. In order to claim any of these prizes, you just need to fill out a short form with your basic contact information and the number of books donated at any of our drop-off locations. We’re also accepting dictionaries as book donations. Incarcerated folks in touch with B&P often request dictionaries through their letters. The reason dictionaries are very in demand is because, 1) dictionaries have the most words and prisoners can re-read them over and over again, and 2) a large number of prisoners did not receive a high school education prior to their incarceration so dictionaries can really help them improve their vocabulary and learn more. We are also requesting donors to please fill out this donors’ submission form for everyone buying books off our wishlist or folks who have already donated or will be donating books either at our Pride Festival booth or any other of our drop-off locations. This is our way of keeping track of donations to award prizes at the end of the campaign. 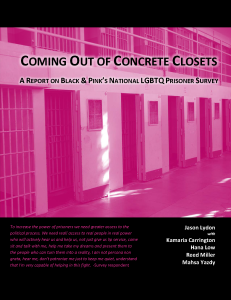 THANK YOU to everyone supporting this project and making queer books more accessible to our LGBTQ family in prison! Hi! I want to donate books but I am not anywhere near the drop off locations (I’m from Texas). Is there a way I can send them still? Hi Elli. I apologize for the late reply. Yes, absolutely. If you refer to the “How can I donate books?” section of this post, you’ll see that we have an Amazon wishlist to purchase books off and when you check out, you’ll be given the option to directly mail the book(s) to B&P’s address here in Boston. I will confirm you later if you can also mail us any books that you already have with you. Thank you for your interest. As a follow-up to the last comment, we are only accepting books through mailing through our Amazon wishlist. 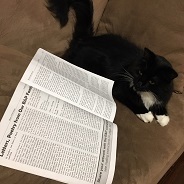 If you wish to donate books that you already have with you, you can donate them to LGBT Books to Prisoners (https://lgbtbookstoprisoners.org) in Madison, WI. Hi! I just came across this post in December. Can I still donate books? Is there a different, more recent project that you would prefer I participate in? These Amazon gift cards from Christmas are just waiting to be used. Thanks! Hi Katherine, please email us at votingLC@blackandpink.org.